With the revelation that Georgiou is the Emperor of the Mirror Universe, the future doesn't seem to be too positive for Burnham. And rightly so since her former - and dead - captain is in this universe a seditious ruler who feeds her guests Kelpien ganglia on chopsticks for dinner before having them carted off for execution; but that's only the start of the troubles in this shorter than usual 37 minute episode (35 and a half without the recap). 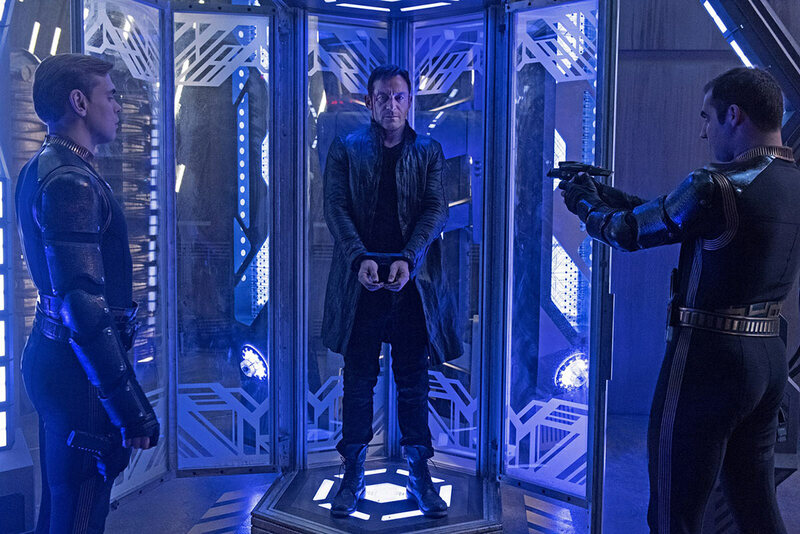 The main thread of this week sees Lorca brought before Georgiou as a traitor to the Terran Empire before being dumped into another agonizer chamber to suffer lengthy punishment until death. Meanwhile Burnham dines with the Emperor whom, we discover, became something of a mother figure to her and Michael's safe return from this foolish mission to capture Lorca has put her mind at ease. Or it would have had Georgiou not surmised that Mirror Burnham had actually been conspiring with the Lorca from the Terran Empire to bring about the Emperor's downfall. 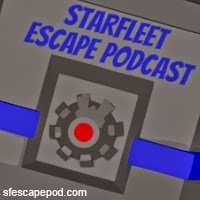 To save her own skin for another day, Burnham reveals that she is from a different universe, using the schematics of the spore drive on the Discovery as a bargaining chip for her freedom. Thing is it's during this final exchange with Georgiou that Burnham suddenly puts together the pieces and realises that her captain is not actually the man she thought he was. 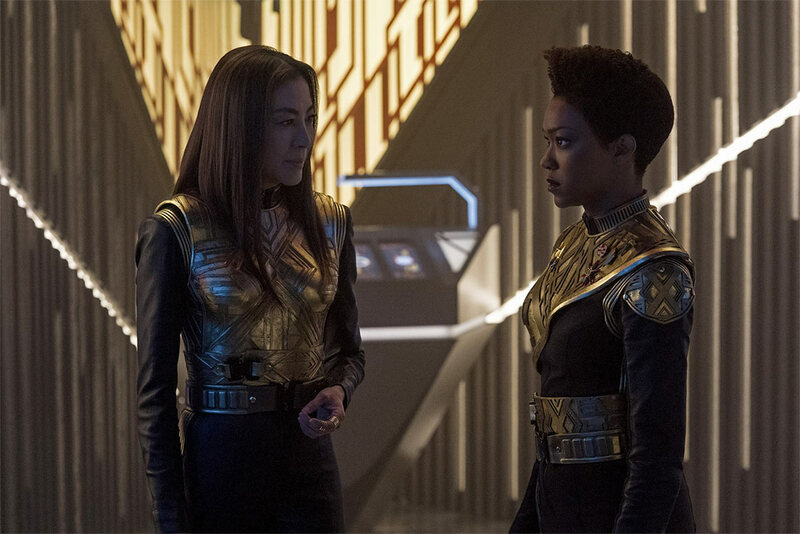 It is Burnham's desire for this Georgiou to be like the captain she knew both acts as her downfall and the tool by which the Mirror Emperor manipulates her into a position that will benefit the Terrans and the Terrans alone in acquiring the technology on the Discovery and simultaneously killing their plans to use interphasic space to return to their own universe. Michelle Yeoh is better here as her bitter Mirror self than she ever was as the captain of the Shenzhou, playing Burnham at every angle while Michael is totally blinded by the belief that her dead captain's duplicate could be the same woman she knew. My thought is whether or not Burnham would be this blinded considering what she has witnessed in this universe along with the mental butchery she has encountered with Tyler/Voq that nearly got her killed last week. 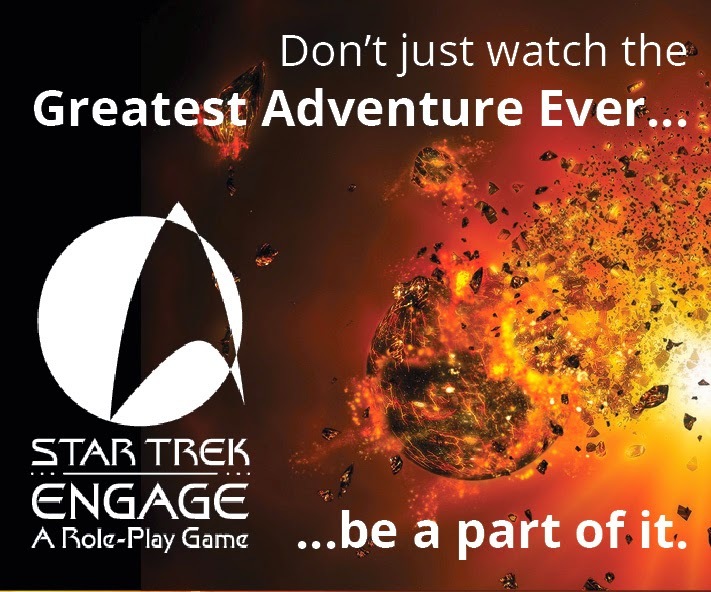 Back on Discovery we have two arcs which both use Saru as their crossover point. He's not doing such a bad job commanding the ship but now he has not just Stamets to be concerned about because Tyler is having some major internal conflict with Voq. OK, let's deal with the biggie here and move on. Lorca. Is actually Mirror Lorca. 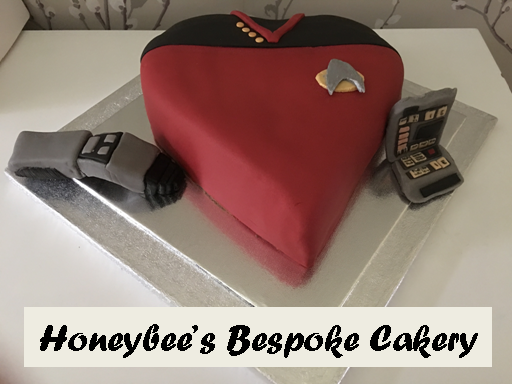 It's not come as the biggest shocker of all time since the signposts have been very obvious and it's been difficult to avoid the rumours and theories right across the Star Trek crevices of the internet. It's well executed here with Lorca choosing to not give in to one of his captors whose sister, it seems, lost her life in Lorca's service. His choice to take the pain right to the end where he is freed in error by said officer shows his determination but more than anything we as the viewer feel vindicated that the un-Starfleet-like nature of Lorca can be easily quantified because he isn't Starfleet. 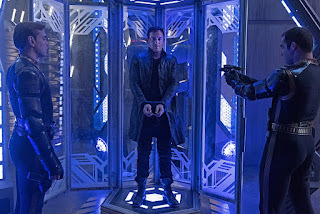 It explains the war room, it explains the eye drops, it explains the Burnham fascination; it explains everything and Isaacs does a superb job of ditching some of the "Prime Lorca" facade when he gets out of the Agonizer booth, putting the boot into his former torturer - and also remembering the name of the girl who died thus confirming he is the Mirror version. 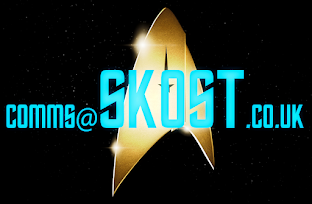 It all kind of makes sense when you piece together a lot of other bits too because god knows how many times Lorca has gone against Starfleet's wishes - his rescue of Sarek, that war room, his obsession with defeating the Klingons - it's all there and sets his apart from not just Picard and Kirk but also strides away from even the darkest aspects of Sisko. What's the score with the "real" Lorca though? Is he still alive? 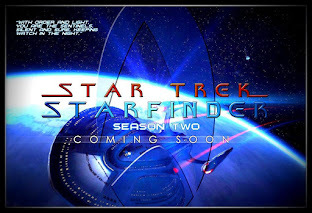 Will he be back for season two or will Mirror Lorca continue to command the Discovery with only Burnham knowing the truth - this would in turn allow for some future twist and meet up of the two of course. 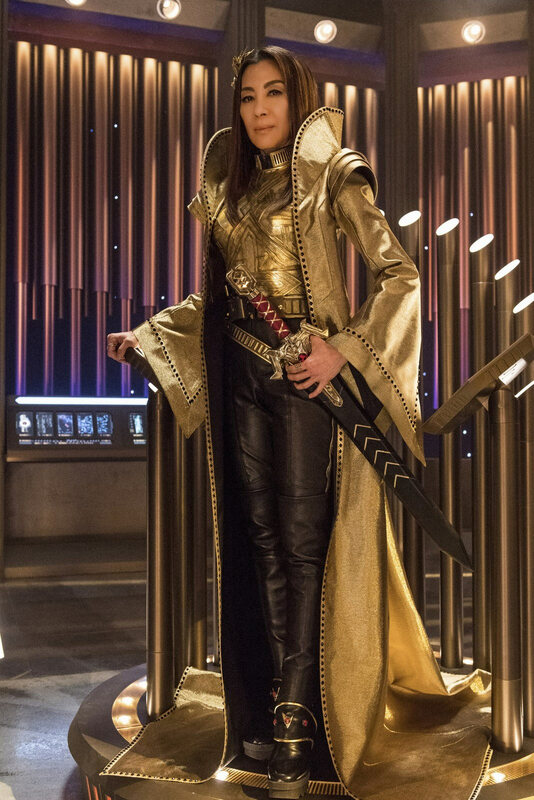 This season has been almost exclusively about hidden layers, multiple layers to personalities, switching roles which is, very effectively, all summed up by the appearance of the Mirror Universe. If nothing screams out about two sides to everything then I don’t know what does and Vaulting Ambition represents the culmination of that with both of Burnham’s most recent commanding officers both being seen here in Mirror form and both having more to reveal than we first see. Everyone has two sides be it Burnham with her Human and Vulcan upbringings clashing or a more literal one in the form of the Tyler/Voq equation, Discovery has firmly been about the diversity not just of its cast but of the range within each of their characters. 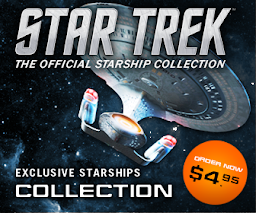 One thing I can guarantee is that I'll be watching Context is for Kings pretty much bang on after the season finale just as a means to compare the start and end points aboard the title starship. 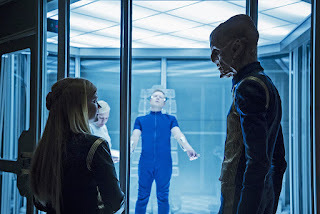 Vaulting Ambition is a good episode but after the tumult of the last two weeks this face to face with the Emperor and the Lorca reveal feel a lot slower even in a 37 minute story which should help speed things up. Lorca’s secret has been signposted and called out a long time ago and perhaps this over emphasis on being clever and plot twisting has taken a little of the wind out of Discovery’s sails. For me this week didn’t have the same level of tension, excitement or character when it came to the main story. Saying that, even the subplots felt a bit plodding. Stamets and Mirror Stamets within the mycelial network was interesting and at least gave us an understanding of what the he has been seeing in his visions as well as what all the Mum kings about forests and palaces was about but add this into the pot with the Lorca reveal and it feels as if we were privy to a 37 minute info dump with not a lot behind it. The Tyler/Voq and L’Rell story seemed to be wrapped up at lightning pace although it does mean Doug Jones gets another excellent monologue opportunity. In fact he does get a lot of the best lines doesn’t he? 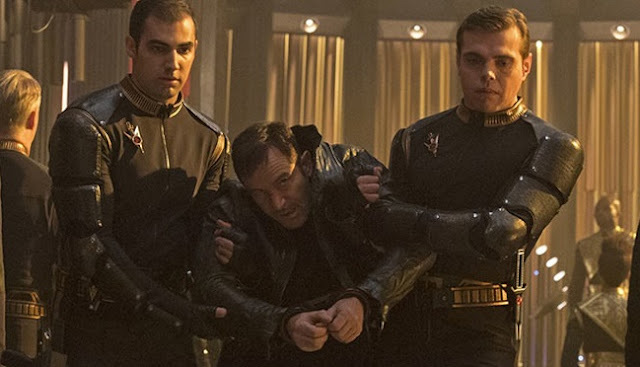 Voq is clearly unstable within the confines of Tyler’s body, destroying not just sickbay but his own body leading Saru to come to a deal with L’Rell to save what is left of one of the personalities crammed into the one body. It’s actually rather terrifying how much Shazad Latif manages to throw himself around here but the end result, a bit of sciencey bobbins from L’Rell sees, it seems, the Voq personality die although I’d put money that this will show its face again. Amazing how she's the only one who can sort it out and it's all resolved in less than two minutes. 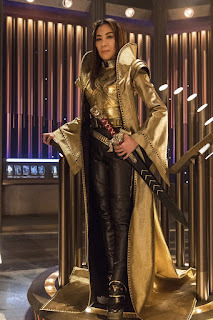 The inclusion of the Klingon Death Howl does signify the finality of the Voq storyline and leaves Mary Chieffo’s character as the sole remaining Klingon in the show and also at something of a loose end in Discovery’s brig. She now has truly sacrificed more than Voq, allowing her lover/co-conspirator to be eliminated for the sake of a Starfleet officer. Vaulting Ambition does take something from it’s title in that it is openly ambitious in its scale. The acting and action are great all through and while those twists have been anticipated we now have the question of What Now? What exactly is going on and how is this season going to come to a close? Where will this ship end up and will it be the same Universe they left in episode nine? We as fans might have worked out the twists so far but with three episodes still left to air there has to be more coming our way. What were your impressions of this week's episode?